The area now known as Carver County, Minnesota was opened up for settlement by the Indian Treaty of 1851. The earliest settlements occurred along rivers which were the transportation arteries of the time as well as sources of power for mills. The surrounding country was a wilderness of woods and swamps, known then as “The Big Woods.” Wild game, fish, and berries were the main diet of the first settlers, and in the spring they made maple sugar in large quantities. Indians roamed through the woods, and though they were peaceful, it was never certain when trouble might break out. The fame of the unexcelled soil of the Big Woods had already spread through the states of Wisconsin, Illinois, Indiana, Pennsylvania, and Ohio, and a heavy immigration had set in from these states. Alexander Moore and David Bickford found a “lovely place for a town in the very heart of the Big Woods” in February 1856 and named it “Rapid Waters.” These two men were business associates of Isaac Ives Lewis in the Union City Town Site Company in St. Anthony (Minneapolis). That spring, convinced of the area’s potential, they drew up shares to the townsite and formed a company with eight other shareholders: John H. Stevens, H.B. Hancock, Henry Chambers, Isaac B. Edwards, M.C. Baker, Lewis Herrington, Henry Kind, and Isaac I. Lewis, who was also appointed secretary of the company by the shareholders. In the fall of 1856, the first road between Minneapolis and Watertown to the west, a distance of about 30 miles (Territorial Road) was built, a project financed by Isaac I. Lewis. Due to the rich soil of the area, there was an increasingly heavy migration of farm families and settlers to this township. A portable sawmill was set up by Alexander Moore along the river to provide lumber to build the town. Over the next two years Isaac I. Lewis, a true businessman, also financed the building of the first cabins, the first hotel, the first store, and the first bridge over the Crow River. He also had part ownership of the sawmill and grist mill, milling arguably being the first industry. Isaac I. Lewis is often credited with making Watertown a successful pioneer town. The financial crash of 1857 slowed further influx for a time, and settlers who had reached the Big Woods experienced hard times for the next few years. The country was new, crops could not be raised until the heavy timber was cut down and burned, and provisions could not be shipped in except by boats up the Mississippi River during the summer. Consequently prices on all necessaries were extremely high, with little or no money in the hands of the new settlers. Had it not been for the generous supply of fish and wild game afforded by our lakes and forests, much suffering might have resulted. To add to the perplexities of these new settlers, President James Buchanan put all this land on the market and enforced payment of $1.25 per acre, with the result that most of the settlers were compelled to give half of their claims to land sharks to raise the means to pre-empt and get title to the balance of the land. Daniel and Anna Justus were the first white settlers in the area of Watertown Township in the spring of 1856 on the shores of Swede Lake. They did not know about the village of Watertown, which was three miles northwest of the Justus place, until three years later. Settlers John Buehler, Dr. Benedict Leman, Seraphin Kemf, Anton Sunie, Benjamin Franklin Light, August and Justus Krause, Joe Gast, and John P. Miller with their families entered the township and struck claims for permanent settlement soon after the town was platted. George Mapes, Christian Singley, Edward F. Hanlin, Eli F. Lewis, L.M. Green, Isaac Rogers, John Crawford, A.J. Brown, J.P. Hendricks, Johan Miller, Ira Kingsley, John Frank, Peter Monson, J.P. Akins, Carl Swenson, Henry Kuntz, Celestine Kohler, Swan Halgren, P.O. Johnson, Henry Tesch, Frederick Hamann, Michael Ketcher, George Goetzman, Julius Tesch, Milton Jadwin, J.A.C. Flood, Gust Miller and C.G. Halgren were among those coming to Watertown township. Eli F. Lewis opened the first store on the west side of the river in the spring of 1857, and a post office was established in the store with Eli the first postmaster. About the same time, J.A.C. Flood came in with a small stock of goods and erected a frame building on the east side. A stage coach from Fort Snelling, St. Paul, and St. Anthony came to Watertown, and the post office was made the distributing point for the surrounding country. From here one route served Waconia, Carver and Chaska; another went to Glencoe, and another to Hutchinson and Greenleaf (Greenleaf was then the location of the state land office), and two more routes branched northward, one to Waverly and one to Rockford. Small branch post offices were established along these routes. The first term of school was taught in the second story of Eli Lewis’ store. W.P. Buck taught the first school in the village and the township the winter of 1857-58. In the fall of 1858, Watertown’s first school house was built—a log structure situated on the hill on the east side of the Crow River, block 68. During the Civil War, Watertown remained at a standstill. Most of its men joined the army of the North, but some sought refuge across the border into Canada to escape the merciless provo marshall. In 1862 the sum of $3000 was raised by subscription to pay bounties to soldiers to encourage them to enlist; the following year bonds in the amount of $900 were issued to fill the quota of the town. But amounts to be paid to each enlistee varied, and many never received what they were promised. By the year of 1865 the village and vicinity had furnished 103 volunteers, and after the last enlistment there was not a man or youth left in the area between the ages of 18 and 45. The advent of farm machinery in the 1870s and the subsequent increased level of agricultural activity in the surrounding area prompted Watertown to experience a “boom.” During this period the town had three hotels, three general stores, a hardware store, drug store, three blacksmiths, three wagon shops, a bell foundry, plow factory, a brewery, two confectionary stores, four shoe making shops, two harness shops, three farm machinery shops, two furniture making shops, an undertaker, jewelry store, seven saloons, public hall, a jail, two physicians, two lawyers, and four churches. Watertown’s first industry, milling, continued to be an important part of the economy with the saw mill and a grist mill operating in the mill reserve area south of the downtown. Watertown’s boom period ended when in the mid-1870s the railroad that had been planned to go through Watertown was rerouted. The village was now cut off from the most important mode of transportation of that period which forced many of the industries and businesses to leave town. The railroad did not reach Watertown until 1915. The city managed to survive this setback by maintaining some of its businesses and attracting new ones and on February 26, 1877, Watertown was incorporated. The food processing industry became an important element in Watertown’s economy in the early 1900s. A canning factory was built in 1918 which was taken over in 1927 by the Minnesota Valley Canning Company and later renamed the Green Giant Company. A creamery was also built during this period. Watertown experienced steady growth throughout the first half of the 20th Century by acting as a retail trade and service center of the surrounding area and by retaining traditional and new small scale businesses and industries. Watertown also developed as a community by making many civic improvements. A central sewer and water system was installed in the 1920s. The public library was established in 1939. In the late 1950s, Watertown Community Hospital was built and continued operation until 1979. A new wastewater treatment plant was completed in 1994 and a new city hall in 1996. In 2007 the elementary school was replaced and the middle school and high school buildings expanded and revamped. First Thursday of most months, 12:30 pm during Central Standard Time or 6:30 pm during Daylight Savings Time, except as noted. Meet at the Old Watertown primary/elementary school, 313 State Street NW, Leisure Room #219. Visitors welcome. Ask about membership! (Download our Membership Application in PDF). St. Peter's Lutheran Church of Watertown celebrated its 150th anniversary on Sunday, September 17, 2017. 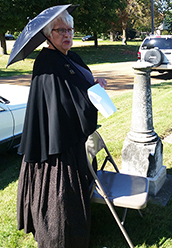 As part of the events, members of the Watertown Area Historical Society gave a presentation at the Church Cemetery. Church members and descendants as well as WAHS members portrayed ten of St. Peter's Church historical people. Click to open a selection of the best photos from the event. Shown below is WAHS member and St. Peter's member Joyce Hinderks, great-granddaughter of Watertown pioneer August Lange, playing hotelier Pauline Zeyer (1818-1881). society.org, or send an email. WAHS participated in the annual Watertown Retailer's Holiday Open House on Friday, Dec. 2, Our display and refreshments (cider and homemade candies) were hosted at the offices of the Carver County News in Watertown. This year&apos;s display showcased vintage toys. 3rd Annual Carver County Community Picnic, with an Arts Crawl sponsored by local businesses, live music, and history displays by WAHS and the Carver County Historical Society, on Sept. 7, 2013. Members of the Watertown Park and Recreation Board, Historical Society and other city officials gathered for a small dedication ceremony April 12, 2012 at Rapid Waters Park, where a series of large signs showcasing the town&apos;s history were unveiled. Two of the signs are in Rapid Waters Park and two of the signs are in Rick Johnson Park. Written by WAHS member Charlotte Johnson, a new edition of this interesting and informative 643-page book detailing Watertown's history from its beginnings to the present day (and containing many pictures, including many you see on this website) will be available in early February 2012, and there are only a few copies not yet reserved. To reserve yours, send an email to the book's author. The two biggest yearly community activities in which WAHS participates are Watertown’s annual “Rails to Trails” celebration the third weekend of July, with exhibits and displays in the Community Center as well as window displays in the Hoffman Building and with participation in the parade; and the Christmas Open House in the downtown Watertown Skyway in early December, contributing material to the year-round display cabinets. More information at the Carver County News/Sun Patriot in November and at the Rails to Trails page. The Watertown Area Historical Society was formed in 1998 to collect, preserve and report the historical story of Watertown and its surrounding area. *Portrait of Chief Little Crow painted by Frank Blackwell Mayer. Photograph of Isaac Ives Lewis by Joel E. Whitney. Both used with permission of the Minnesota Historical Society. Site constructed by Nancy A. Pickering, Pen and Brush Communications, Minnesota, U.S.A.